Peplink cellular router and modem provide unbreakable connectivity to maintain mission-critical communications. Peplink Balance router with Dual-WAN, Multi-WAN Internet Link Load Balancing Routers. Peplink MAX series of industrial 4G routers are designed to provide secure WAN access in environments where wired solutions are too expensive to deploy. 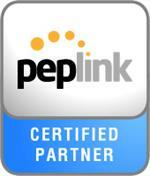 Peplink New Class of Switch with Cloud Intelligence. SD-Switch with Software Intelligence. The Peplink AP One access point series delivers enterprise-grade performance, the flexibility to deploy anywhere, and easy setup and management.